Alix is a rich girl at a private school outside New York. She doesn’t know it yet but she has been targeted by some stranger who only has eyes for her. The first inclination she has of trouble is when this young black guy attacks the school principal right in front of her and all the other kids - somehow she knows this is directed at her and when the next attack comes and rats start pouring out of the school building – the stranger makes contact. Alix asks why? Why are you doing this and he says ‘Ask your father’. Alix is an attractive, very focused Daddy’s girl. She has never questioned where the family wealth comes from, but now this stranger has woken her up. When he captures her and traps her in a cage – she is fully awake. Her father runs a successful PR company for just about every evil drug company that exists in the USA and his job is to allow them to keep making drugs they know may be killing people so they can make their billions. Each one of the teen gang that has captured her has lost parents to the lethal drugs that they were given. This is payback and they mean to get Alix’s father, Simon Banks and make him pay. This is a modern take on the Patti Hearst story. (The heiress who fell in with her captors and went rogue). Alix discovers that her life is a lie and that even those closest to her at home or at school are not to be trusted. Like the Hearst story – it is based on fact. The drug companies are out to kill us – the dead are merely acceptable losses in the giant trillion-dollar game. Bacigalupi tackled the future of food and energy in his The Windup Girl – companies like Monsanto developing nutrition free food that means no one goes hungry but we all starve to death. 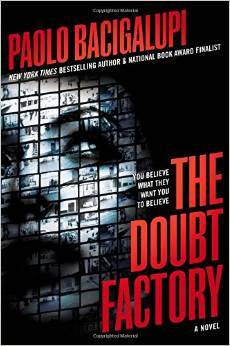 The Doubt Factory (PR speak for sowing doubt in peoples’ minds) is another dose of reality check. I agree with his message but sometimes the facts get in the way of a good story and this often feels a little too earnest and for some readers the history of how our drug companies have been systematically poisoning us might be hard to swallow. Speaking as someone who came out in boils from taking statins – I am full sympathy with Bacigalupi. But Alix vacillates too much. She is either her father’s daughter or a willing convert. When her stalker evades all the security around her house and she lets him in – I feel it is out of character - no matter how 'hot' he might be. Her father seems real, but the rest of her family are underdrawn. The teens that capture her are well put together however and credible, you can feel empathy with them. Even though I didn’t enjoy this present day fiction as much as his excellent sci-fi novels – I sincerely hope a YA readership does plough in and experience the kind of political change that overcomes Alix. We need our teens to wake up and realise they are being systematically poisoned by the corporations – not just by the drugs they take, but the processed food they chew on. Next time you have a headache or a cold - The Doubt Factory does a very good job of informing the reader of just how evil those little pills you are about to take really are. Nailer is tough, like his name, wiry, small, which is lucky, it means Nailer gets to work on the lite crew that’s stripping the innards of a beached oil tanker on Bright Beach in the Gulf of Mexico.